Ravenscroft, an independent pre-K-12 school in Raleigh, N.C., is celebrating its 150th anniversary this year. Its legacy and values run deep within the extended community of students, alumni, faculty, staff and families. 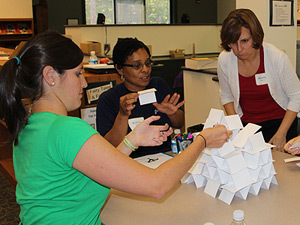 Ravenscroft teachers practice teamwork during Index Card Castle activity. Even as the school celebrates its history, the focus is on the future. A new strategic vision — and a collaboration with the Center for Creative Leadership (CCL®) — emphasizes leadership and citizenship development as essential for educating graduates to be “game-changers” now and as adults out in the world. Beginning in 2012, CCL contributed leadership frameworks, research and tools, along with an appreciation of learning and development processes. Ravenscoft’s faculty and staff shared their deep knowledge of teaching, child development and the school community and context. Learn about Leadership Beyond Boundaries work in the education sector with Research and Innovation Incubator partner, Ravenscroft.